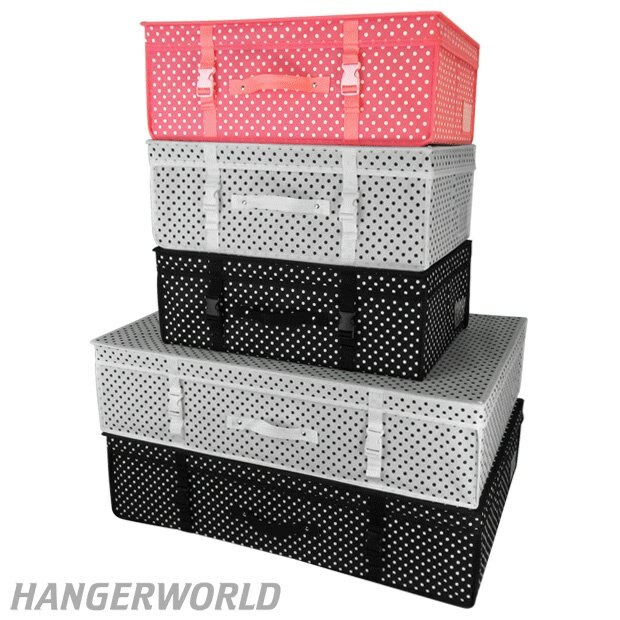 Gorgeous polka dot breathable storage boxes. With handles & clip fastenings. Strengthened side panels and hinged lid. Useful clear ID document pocket on front. All sizes come flat packed - easy to make & can be folded when not in use. Also comes with 10 large sheets of acid free tissue (each sheet measures 78 cm x 50 cm). Perfect for safe storage and travel of your precious garments, keep-sakes, etc. Medium size boxes are usually within airline hand baggage restrictions (but please confirm with the specific airline that you are going to fly with). Medium: Length x Width x Height 55 cm x 35 cm x 20 cm (21.7 x 13.8 x 7.9 inches) approx. Large: Length x Width x Height 80 cm x 50 cm x 20 cm (31.5 x 19.7 x 7.9 inches) approx.